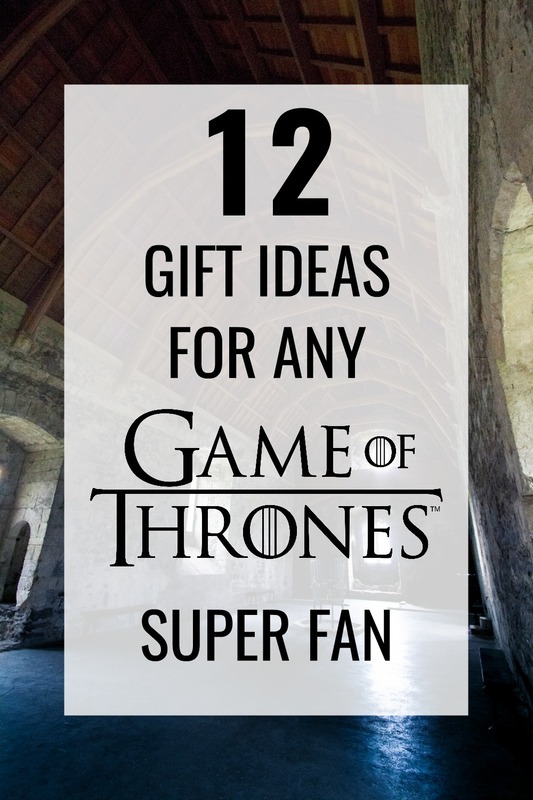 Ready for some great Game of Thrones Gift Ideas for the loyal fans in your life? Check out the many hot gift items that are inspired by one of the most popular shows on television right now. There may be another year before the next season of Game of Thrones, but that doesn’t mean you can’t keep things alive with these Game of Thrones gifts! Because who wouldn’t want to play this classic board game in the GOT style?! Monopoly: GOT is a great way to pass the time while you wait for the next season of the show to air. Forget winter – have some dinner! This professional-style cooking apron is perfect for grilling up your favorites for a GOT party or just because. The bold House Stark crest displays the chef’s love for the hit show. Get your Tyrion on with this glass featuring one of the most popular quotes from the show. Relax with a glass full while you watch the newest episode! Imagine the compliments anyone wearing this amazing GOT charm bracelet would receive. This stylish accessory is perfect for anyone that is a loyal fan, with 12 iconic charms sporting various themes of the show. Bring some House Stark to your desk with this classy letter opener. It’s a replica, sure, but still does the job cutting through envelopes and paper. Now man and wife can both show off their love for each other – and for GOT! – with this matching coffee mug set. What time is it? Game of Thrones time, of course! This hand-crafted wall clock features iconic symbols from your favorite show. It’s made of a vinyl record too, so it’s a one of a kind memorabilia for GOT fans. Create your own feast just like one at Winterfell with this amazing cookbook. If you know a GOT fan who loves to cook, this cookbook makes a perfect gift! No matter your favorite characters on the show, you can cuddle up and stay warm when “Winter is Coming” with this soft throw blanket. Snuggle and watch your favorite show! Show your loyalty to your favorite house with this elegant scarf. This is the perfect winter accessory to keep warm while supporting House Targaryen. Protect your house with this Ghost figure from Funko Pop! There are many other GOT characters as part of this collection, but Ghost is a great place to start amassing these figures. Unwind and relieve some stress with your favorite characters and families by coloring the gorgeous illustrations in the official GOT coloring book. I’m working on more gift guides soon, so feel free to leave a request for a topic below! These are awesome!!! Everyone I know watches GOT except me and I am definitely saving these for later! Her Wolf – his Dragon mug set was just wow, A perfect couple gift I must say. I would go for Monopoly – GOT special collection as well. Personally love playing Monopoly with my niece. I’ve got a GOT coloring book that I bought from Amazon World in NYC last month. I’m a huge GOT fan and some of my Girlfriends are GOT fans too! These are some amazing gift ideas for the holiday season that I’ll keep in mind! These are great suggestions as Game of thrones gift ideas.I like the bracelet.It looks cute.The apron is fine too. My husband is obsessed with Game of Thrones. I have added the cook book to his Christmas list, as I think he would love that! Haha as I am a big fan of GOT I love all of them! One thing that I would love to have that is not on the list is a tshirt written “I am not a princess, I am a Khaleesi!”🙏❤️ Can you belive it, there people who belive that they are so cool not having seen one single episode. Its like not having taste chocolate in your entire life! That is missing something really good! So good to know!! Especially now that the festive season is approaching and we need to buy gifts! I am not a fan game of thrones fan at all. but I’m sure there are many who would like to have some of these pieces. This is an awesome list. And as a definitely Game of Thrones Fan, i geeked out on all of these. My two favorites would be the vinyl record clock or the cookbook. Very cool post, I am sure GOT fans will love this. Ahh! Wish I could relate!! hha, I need to watch this show! ! These are great ideas! Perfect for my husband, he is a fan of the show! I love the show so these are really awesome gift ideas for any GoT fan. I am embarrassed to admit this, but I have never seen the show! My sister is obsessed though, so these are great ideas for her for the holidays! This is amazing!! I’m obsessed with GOT! So fun! I haven’t watched this show, but this looks like a great gift guide! I haven’t watched this show yet but I want too! I am a super fan and love all these goodies!! It will help to wait until the next season!! I need to jump on the bandwagon and start watching! Those are all great ideas!! Love GOT! SO many great ideas, I really like the apron!